The greatest distance between a body in Mars orbit and Mars, i.e. the apoapsis of a body in Mars orbit. 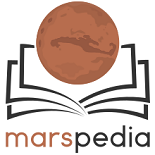 The shortest distance to Mars is known as Periareion. Unlike apogee, other apsides such as apoareion and apolune are measured from the center of mass and not the surface of the body. This page was last edited on 10 July 2018, at 08:39.